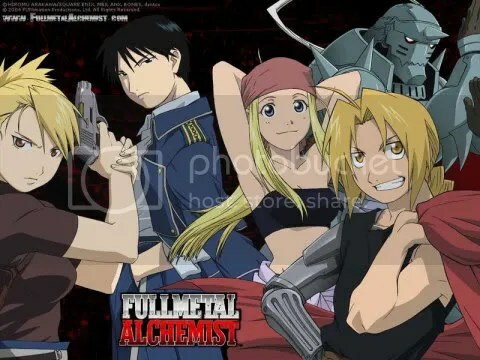 Fullmetal Alchemist (Hagane no Renkinjutsushi, “Alchemist of Steel”) is an action/adventure/science fiction anime series that first began as a manga in 2001, then appeared as an anime which began airing in 2003. The series is 51 episodes long and is available in Japan, as well as in America via FUNimation Entertainment. This review will break the series down into several parts, culminating in an overall review and score which readers are encouraged to discuss via comments left to this review. I’ve actually never watched Fullmetal Alchemist until just now, which may surprise a lot of people. I’ve met Vic Mignogna, who does the American voice for the main character Edward Elric, several times and he often talks about how much he loves the show and how much he loved working on it. When I told him I hadn’t seen it, he urged me to do so, and I promised myself that I would one day. I finally decided to set aside time to watch it when my friend Jon had an Anime Sampler Night, which included the first two episodes of Fullmetal Alchemist: Brotherhood, a remake of the original series that is supposed to follow the manga storyline more closely. I really enjoyed what I saw, and so I went home and started watching the original series with subtitles. Jon encouraged me to watch the dub instead because he felt it was done very well, which is a rare thing for Jon to say. So he decided to lend me all of his FMA box sets and I got to watching. The story centers around the Elric brothers, Edward and Alphonse, whom lost their mother to illness when they were young. Their father had taught them some alchemy, and so they attempted to use it to bring their mother back to life, something that is considered very dangerous and taboo in the alchemical world. As alchemists, they are subject to the Law of Equivalency, and as a sort of karmic punishment for performing the ritual Edward loses his left leg and right arm, and Alphonse loses his whole body, forcing Edward to seal his soul into a suit of armor. Faced with the consequences of their actions, both brothers will become dogs of the military, using those connections to try and find the mysterious Philosopher’s Stone, which they believe has the power to return their bodies to normal. The art of Fullmetal Alchemist is downright beautiful. The character designs are simple but very effective; you get a good sense of what the characters are like just by looking at them. Each character is also very distinctive, so it’s easy to recall a character by their actions even if you forget their names. The landscapes of all the different places the characters visit are breathtaking, and the effects whenever a character performs alchemy are very well done. Definitely of the most visually appealing anime series I’ve ever watched. As for the overall feel of the show, I think it’s balanced very well. There is of course a lot of action and drama, but there’s also aptly placed comedy, and you’re never left feeling like the show is too serious or not serious enough. I can’t tell you how much I love the music in this series. Not only is the background music beautiful and very atmospheric, but the opening and ending songs are catchy and very enjoyable. As for the voice acting, both the Japanese and American dubs are wonderful. Whether you prefer your anime dubbed or with its original vocal track, you’ll love what you’ll hear. I loved Fullmetal Alchemist. Besides the story and visuals being very appealing, it’s a beautifully executed show. The characters are rich and given a healthy (but not overwhelming) dose of back story, and we get to see a lot of minor and seemingly episodic characters return, leaving you satisfied in knowing what happened to them. The ending is also very satisfying and leaves little to no questions left unanswered. If I understand correctly, the true ending of the series lies in the FMA movie, Conqueror of Shamballa. I’ll definitely be checking that movie out. Fullmetal Alchemist is a beautiful and well-balanced show that anybody would enjoy. If you want a slightly longer than normal anime series with great characters and a satisfying conclusion, definitely pick this show up. I promise you, you will not be disappointed. For Father’s Day, my father asked my brother and I to get him Tiger Woods PGA ’10 for the Wii. This particular game happens to come packaged with the Wii MotionPlus. I didn’t think anything of it at first really, but when he started using it, I knew I HAD to write a review on it. I’ll start with the good parts of it. First off, let’s talk about how it’s packaged. It DOES come with a longer Wii remote sleeve, and it’s own instruction manual, which is just hilarious to me. Anyway, it’s surprisingly easy to use and set up. You just slide it into the bottom of the Wii remote and use the lock slide on the back of the MotionPlus to keep it in place. There’s a flap on the back of the new, longer remote jacket to thread the wrist strap through, so there’s no impediment there. It looks nice on the bottom of the Wii remote, and the jacket fits just as snug as the smaller one. Very nice. There’s also a flap on the bottom of the new jacket to plug the nunchuck into the bottom of the MotionPlus, which fits nice. The MotionPlus is very responsive, and gave my father nice, clean golf strokes, and his game play pretty much mirrored his normal golf game scores, which I’ll take as a testament to the MotionPlus’ accuracy. My only regret about this review is that I didn’t get a chance to handle it myself, although my father really liked the way it handled, and he is a pretty fussy gamer, so that’s a good thing coming from him. I don’t really have much criticism. They pretty much thought of everything to make sure it’s easy for someone to pick up and use, and it really is very accurate. I only have one or two problems with it. When I picked up the remote with the MotionPlus attached to it, it was surprisingly heavy, believe it or not. Now, for an 18 hole golf game on the Wii, this may not be bad, but let’s take another game into account. Red Steel 2 for instance, which requires a LOT of remote swinging. I can easily imagine anyone’s arm tiring rather quickly while swinging that extra weight around. The other thing that I noticed is that, in some situations, it may be too accurate. While trying to create a golfer for himself, my dad seemed to have quite a bit of trouble centering on buttons long enough to click on them. Anyone with a shaky hand or who likes to blow through selection screens might find this a bit troublesome with the MotionPlus. I only have two questions which were left unanswered. Can you keep the MotionPlus connected even when playing games that don’t support it? My father expressed quite a bit of annoyance at the idea of having to detach it and put on the other remote jacket every time he played a game that wasn’t Tiger Woods. How much battery power does the MotionPlus use up? Obviously since he only played one round of golf, I can’t speak for the longevity of the battery life in this regard, but I imagine it pretty much has to use battery power, so it has to decrease the battery life to some degree. How big of a degree is really the question. So, I hope you all found this informative, and I hope it helped you make a decision as to whether you want to pick up a game that uses the Wii MotionPlus. It works really well and I think it’d be worth it personally, especially since it’s being bundled with many of the popular games that use the peripheral. The game was $60 though, so we had to pay an extra $10 for the MotionPlus in the end. Still, I don’t think that’s a bad price to pay for the extra accuracy it gives you in-game. Feel free to comment on your own thoughts on this review and the Wii MotionPlus!